This past New Year’s, Lighthouse gifted Donald Whitney’s Praying the Bible to the congregation – did you get one? We hope so! Pastor Tim shared this past Sunday how praying through the Bible can be a helpful method for prayer and personal devotions. In growing our devotion to the Lord, what better way than to cling to the Word and to prayer? I know for myself, it’s easy to get distracted or side-tracked when trying to spend some quiet time in prayer. After, I tend to feel like my prayer life is rote or lifeless, lacking creativity or passion. What is wrong with me? 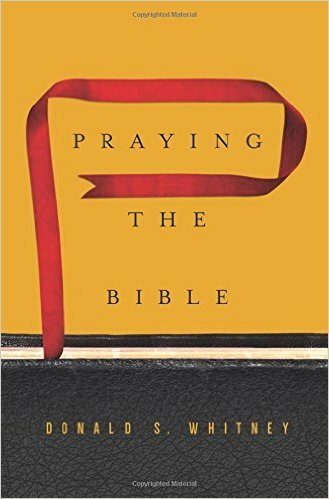 In his book, Whitney encourages us to rethink and rehone our method of prayer – specifically, by using the Bible as a guide for our personal prayers to the Lord. He gives practical, easy ways to pray through the Psalms, then through other parts of the Bible. John Piper writes that, “Praying the Word means reading (or reciting) Scripture in a spirit of prayer and letting the meaning of the verses become our prayer and inspire our thoughts.” (You can read more of Piper’s thoughts on praying the Bible here). We do hope this book is an encouragement to you! It certainly has been to me!